This accusation came to us from the web sites of both Dirk Anderson and Robert Sanders. According to what Dirk has told us, this is his very best example of Ellen White contradicting herself, and consequently, one of his very best evidences that Ellen White was not a divinely-inspired messenger. Essentially, Dirk feels he has found a concrete example of where Ellen White didn't practice what she preached. Ellen White, like John Wesley, Charles Spurgeon, and Charles Finney, believed that Peter and Paul in the New Testament encouraged Christians not to wear ornamental jewelry. Why? What's the big deal? Well, they felt that it was wrong to spend lots of money to decorate ourselves merely to gratify pride and attract attention. We'll take a look at what each of these writers actually said in our Further Analysis section. We now quote this allegation, written by both Dirk Anderson and Sydney Cleveland, from Dirk's web site. "To dress plainly, abstaining from display of jewelry and ornaments of every kind, is in keeping with our faith."2 . . .
1. Photograph on file at the James White Research Library, Andrews University. Digital images were taken from the book White-Washed by Sidney Cleveland. . . .
2. 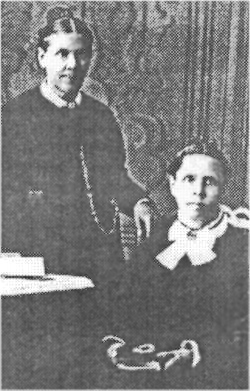 Ellen White, Testimonies, Vol. 3, p. 366. Dirk and Cleveland stated emphatically above, "a decorative brooch and a gold chain." From the picture they give to prove their point (see below), we can't tell whether the "chain" is gold or not, and it isn't because we're color blind. It's because whoever took this picture around 1878 forgot to put color film in their camera. We thus can't tell if the "chain" is made out of gold, brass, leather, or hemp, or whether it's a chain at all. Neither can we verify that the brooch in the picture was decorative. The detail of the various versions of the photograph that we have examined just isn't good enough to know for sure. Looks like this one may be hard to prove. Since the picture as given on Dirk's site includes Elizabeth holding a book, a part of the photograph omitted in Cleveland's book, we know for certain that that picture didn't come from Cleveland's book. This is but a minor discrepancy, though since Dirk's site specializes in accusing others of plagiarism, it would be best if he acknowledged every source. While the background is grainy (a residue of the printing process), the faces and dresses are smooth. This is because they have been selectively blurred using photo-editing software. 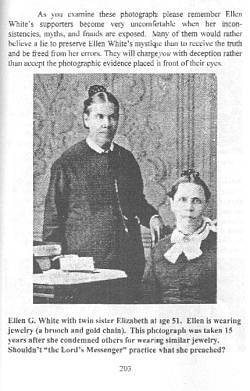 In Dirk's picture the "gold chain" is much, much lighter than Ellen White's dress, while in the picture from Cleveland's book it is the same shade of grey as most of her dress. This indicates that the color of these parts of the picture has been tinkered with as well. Anyone who has edited scans of printed pictures will easily recognize that this was once a halftone in a book or periodical. It was then scanned into a computer, and after scanning was doctored up. At least part of the tampering took place after the picture was scanned. For those who are unfamiliar with such techniques, we've taken an excerpt out of Dirk's picture and have blurred it. Notice how the graininess left over from the printing process has disappeared, making the entire picture as smooth as the dresses and face are. Whoever tampered with this picture made the "chain" lighter than the wall, when in the original it is much darker than the wall. They also took the liberty to draw the chain to the side of the dress, when in the original it ends at the front of the dress. Honestly, it appears to us that Ellen White was wearing a pocket watch. We therefore had this picture analyzed by a Mennonite who is an authority on antique watches, and he confirmed our suspicions. 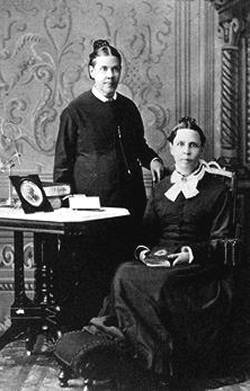 He told us there was no doubt that Ellen White was wearing a slide chain for the pocket watch that she had in a pocket on the front of her dress. Unfortunately, whoever tampered with this picture wasn't as knowledgeable as our Mennonite friend. Hence they drew the "chain" so that it extended over to the side of her dress. In the following pictures take note of the one on the left. 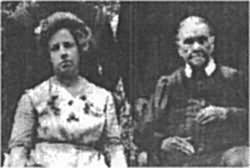 It is the original photo of Mrs. White with her granddaughter, Ella Robinson. 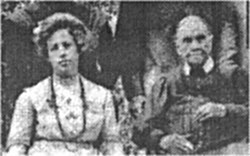 On the right is the retouched photo appearing in Ellen G. White, The Later Elmshaven Years, with Ella's necklace noticeably absent. Apparently the White Estate is not only adept at altering the words of Ellen White but they are also proficient at altering photographs. The alteration is necessary in order to perpetuate the myth that early SDA's did not wear jewelry. Thus, the very best example that one of Ellen White's most avid critics has of her contradicting herself appears to be one of the very best examples of the critics contradicting themselves. This is so utterly bizarre. How can any critic of Ellen White expect anyone to believe them when they tamper with the evidence, and then immediately accuse others of doing the very type of tampering that they just did? Will Dirk post an apology on his web site for that tampered picture? I think he will publish a full apology on his web site for posting that tampered picture for so many years. That would be the only Christian thing to do. Don't hold your breath. You're too naive. He'll quietly change the picture now that he's gotten caught, but he won't post any hint on his web sites that he did anything wrong, or that he changed anything. He didn't do anything wrong, so he doesn't need to apologize for anything. He's on a mission to destroy Ellen White's credibility, and he has to do what he has to do. I don't have a clue what he's going to do, but I'll be watching. But this has damaged his credibility in my mind.